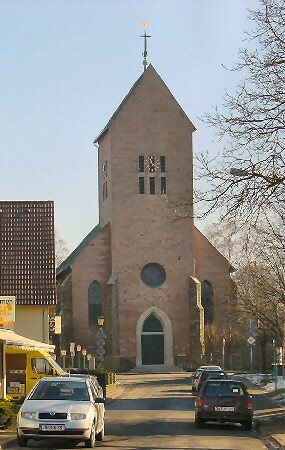 Remains of church at Vossenack. 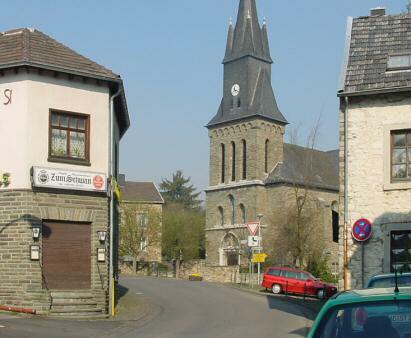 After changing hands several times, the church was retaken on 7 November by Company A, 146th Engineers. 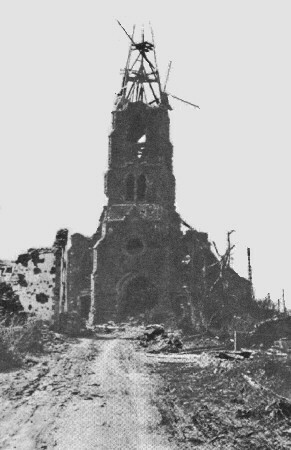 The Saint Josef church was rebuilt after the war. 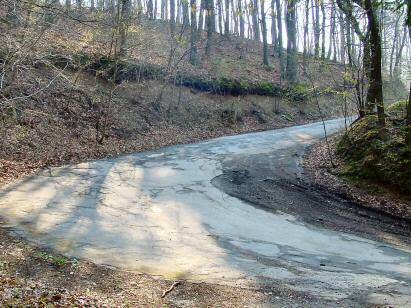 In front of it, to the right, is the turn-off to the Kall gorge. 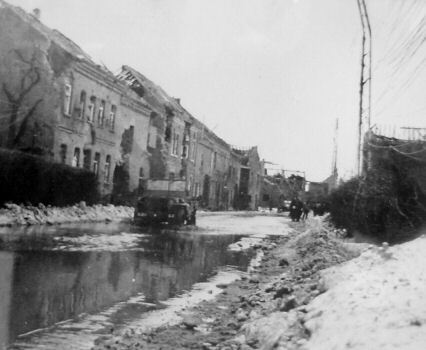 Im Oberdorf Street at Vossenack on 15 November 1944. 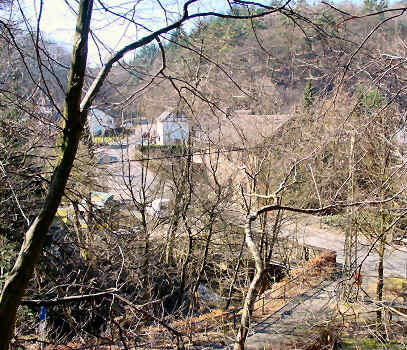 Germeter lay in full view of the Germans on the Brandenberg-Bergstein ridge further east. 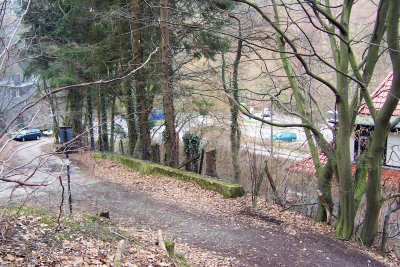 To conceal movement along the highway towards Hürtgen, screening nets were hung up sometime in November, after the 8th Division had taken over from the 28th. 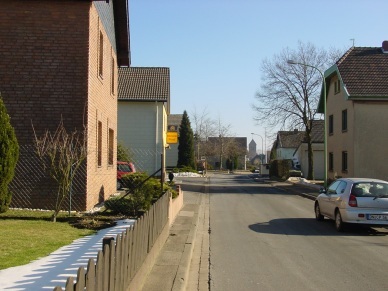 The much better surfaced B399 highway from Germeter to Hürtgen today. 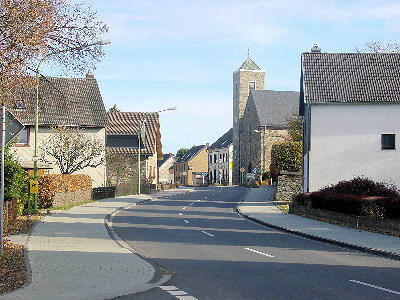 The Friedensmuseum and the town center of Vossenack is away to the right. 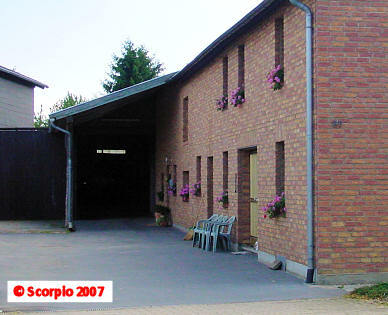 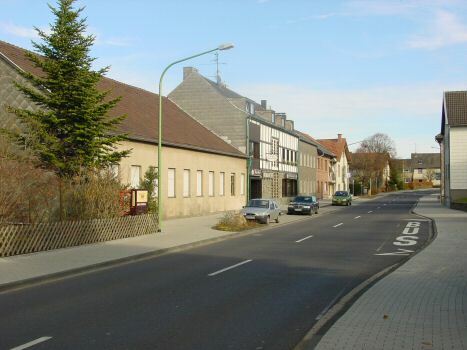 The men of Headquarters Company of the 121st Infantry installed themselves in a farmhouse along the main street of Hürtgen. 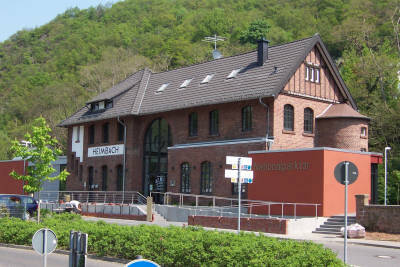 The "Hurtgen Hotel" was located on 89 Höhenstrasse. 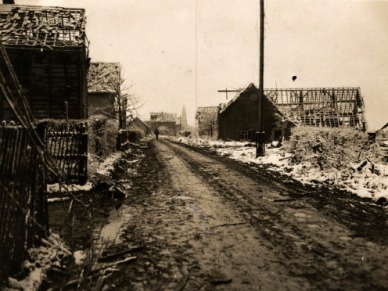 The village that gave the battle its name Hürtgen was finally taken by the 121st Inf.Reg. 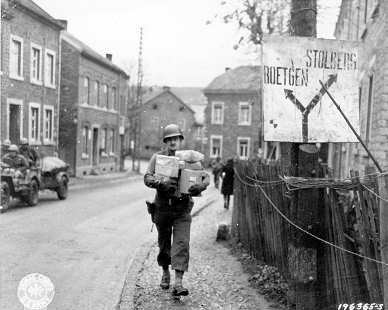 and the 1st Battalion of the 13th Inf.Reg. 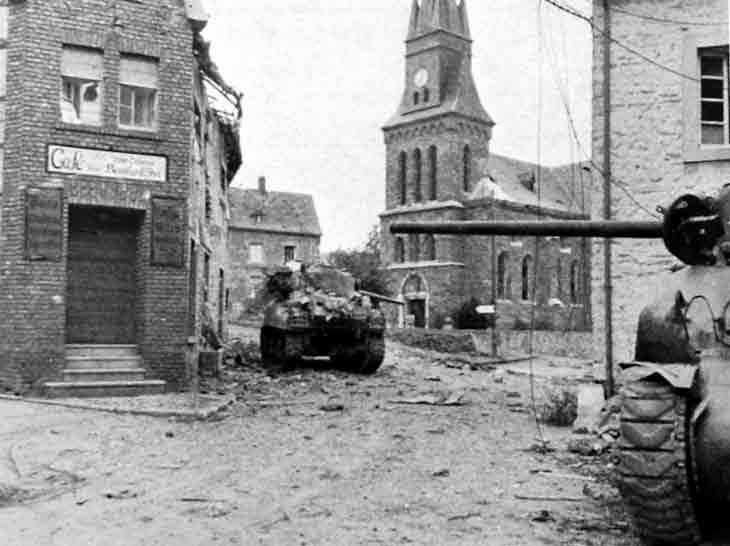 of the 8th Div. 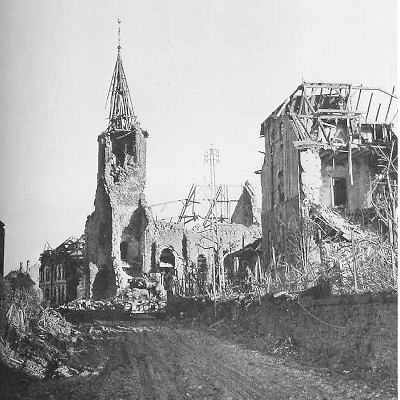 The ruined church building of the holy cross of Hürtgen was already rebuild in 1949. 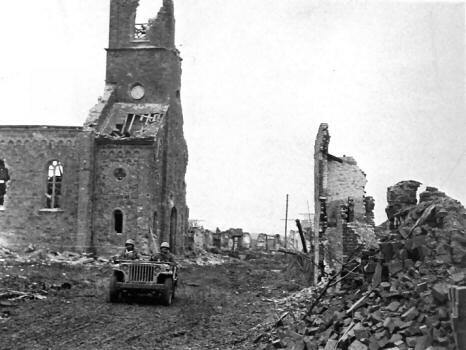 A jeep of the 22nd Infantry, the unit that captured Grosshau, passes the shell-wrecked village church on what is left of Frenkstrasse. 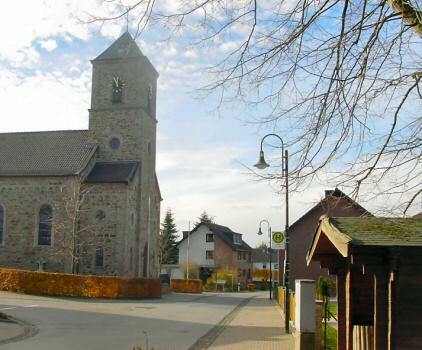 Whereas most of the other buildings at Grosshau were cleared away completely and rebuilt from the ground up, the Sankt Appolonia Church was very carefully restored to its original state. 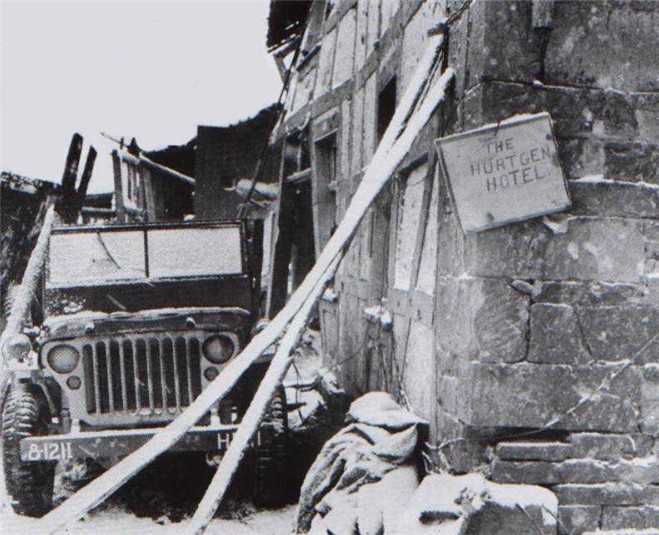 No Shermans standing guard today. 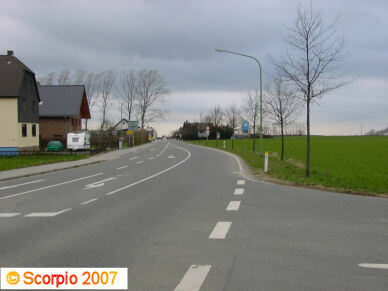 The main road leads, left, to Gressenich and Stolberg and, right, to Langerwehe. 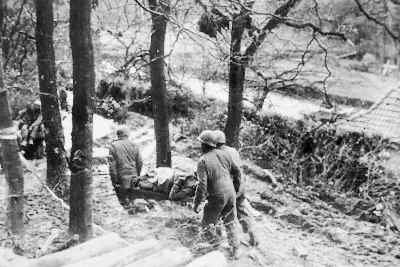 Litter bearers carrying a wounded soldier. 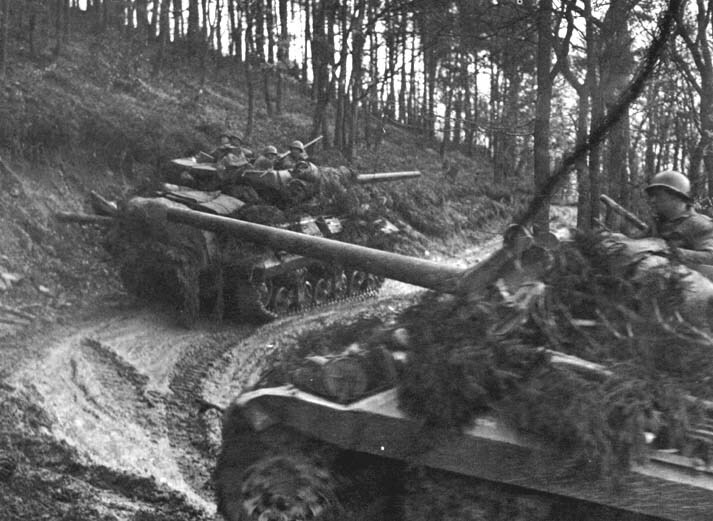 M10's of the 803rd Tank Destroyer Battalion twisting and turning on the slopes south east of Schevenhütte. 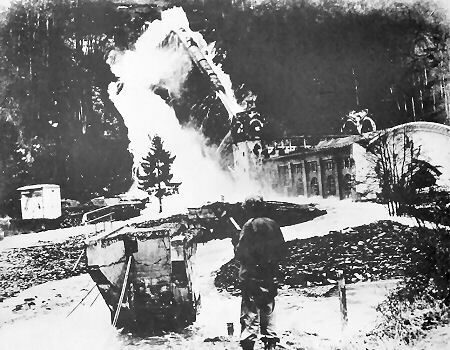 On February 9, 1945, the Germans blew-up the pressure pipe from the Urft reservoir at Heimbach Power Station. 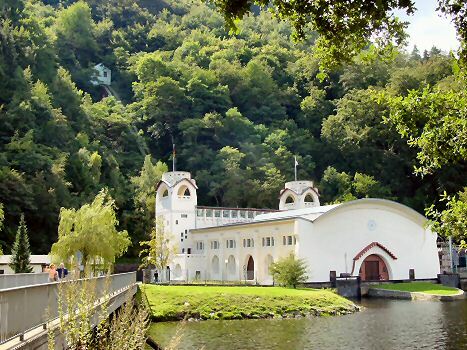 The Hydroelectric Power Station in Heimbach, imposing building in the Art Nouveau style. 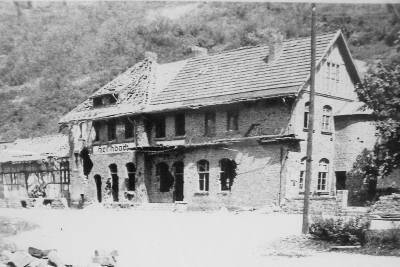 The war damaged building of the Heimbach railway station. 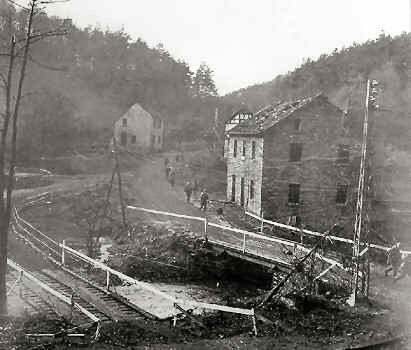 Building a bridge in Monschau. 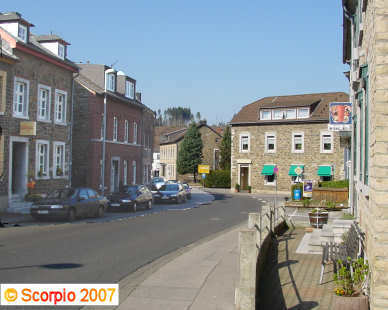 2d ECAR, Detachment I4G2, commanded by Capt. 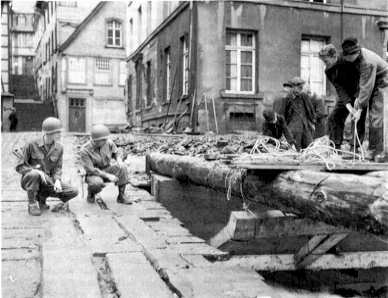 Robert A. Goetcheus, second from the left. 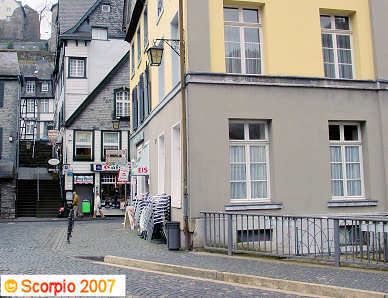 Bridge across the Roer river in the romantic Old Town of Monschau.